Many bookmakers will offer free bets to customers. These can be used to give incentives to new customers, or to reward existing customers. The online gambling industry is fiercely competitive. Technological developments have increased the number of companies able to enter the market. By offering free bets, particularly to new customers, bookmakers are able to show off their website and range of markets, demonstrate the competitiveness of their odds, make it easy for customers to bet again (by giving an account, login, fast track payment details), increase the chances of a positive first customer experience (i.e. a win) and build loyalty. Offers can very quickly change and vary so it is important to keep up to date and ensure a chosen offer is still valid. Bookmakers traditionally offer improved offers to coincide with major sporting events including major football tournaments, Wimbledon tennis, six-nations rugby, major golf tournaments and large horse racing festivals. The most common new customer bet offer is for the bookmaker to give a matched first bet as a percentage of the stake (often 100%) up to a maximum amount. 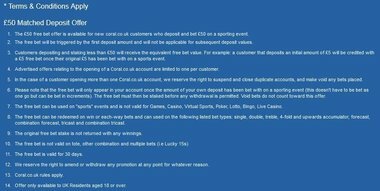 So for example if a customer opens an account and bets up to £50 this will be matched with a free bet the customer can use on another event (this would be a 100% matched free bet). An example of this is in image 2. Another popular new customer betting offer is a first bet refund up to a certain amount, should the first bet lose. Image 3 shows an example of this type of free bet. A third new customer offer awards gives a free bet with no requirement to deposit or bet a qualifying bet. For example offering a £10 bet to any customer who signs up for an account. A certain level of risk on the first qualifying bet (meeting prescribed odds or number of outcomes, normally this will be odds of evens or greater, and 3 outcomes or more). This prevents a customer betting on something really likely to happen just to gain the free bet. Bet a certain minimum amount (there will also be a maximum amount the bookmaker will give as a free bet). Bet on certain prescribed markets (often live markets are not counted). The stake will be very unlikely to be returned in the payout, only the profit will be awarded (this is because the free bet stake is the bookmakers money, not the customers). Free bets may appear as a separate balance, or as a separate option in the betting slip, cash is unlikely to simply be added to the balance. Image 2 shows a free bet being selected on a betslip. Free bets/refunds may take a set time period to be credited and available for use, this can be up to 48 hours after the first qualifying bet settles. There may be a turnover requirement on funds won from the free bet. This means if a free bet wins the customer may have to bet through the winnings before they can be withdrawn. Bet offers for existing customers are offered to reward business, or to encourage lapsed customers to return to a particular betting site where they have an account in place. It is always worth checking e-mails regularly to see if there are any bets on offer. Existing customer free bets may work in the same way as a new customer bet in requesting a qualifying bet (to generate the free bet) which is a certain amount and level of risk on a specific market. The free bet may then be subject to similar terms to a new customer free bet. Protected bets which return stake if your bet loses at the very end of a contest (e.g. a team concedes after the 85th minute of a football game). There are many more examples, and customers are advised to regularly check bookmaker homepages for the very latest offers.